Apple's iPhone 6 FREE ? Of course not ! It’s only a hoax, but scammers have announced the just release iPhone 6 free. But before you proceed to the last step, a pop-up window leads you to participate in a survey before you can download the application. The survey will ask you to share your name, address, phone number and email address - all the information that is collected by the third-party operating the survey page, and likely sold on to marketers. Meanwhile, the scammer earns money for every survey through an affiliate marketing scheme. Even after completing the survey, the pop-up will inform you that your survey was not completed properly due to a 'minor error' and it will urge you to participate in yet another survey. No matter how many times you fill the surveys, most of the times you'll not get to download the 'application'. In case, if you are directed to the download link, there is no guarantee that the download link is legitimate, but contains malicious code. It could lead you to a malicious software that could steal users’ sensitive or financial information from the infected system. The only thing you can be guaranteed not to get is an iPhone 6! This particular Facebook scam page has been removed by the social networking giant, but not before getting nearly 18,000 "likes". Remember that surveys are always a pain, but scam pages or websites offering up random redirects always bear the possibility to be even more troublesome, because you simply never know where you’re going to end up. We have seen various suspicious posts on Facebook, like "See your Friend's naked video", an app offering you a chance to see who has viewed your Facebook profile, and many more. 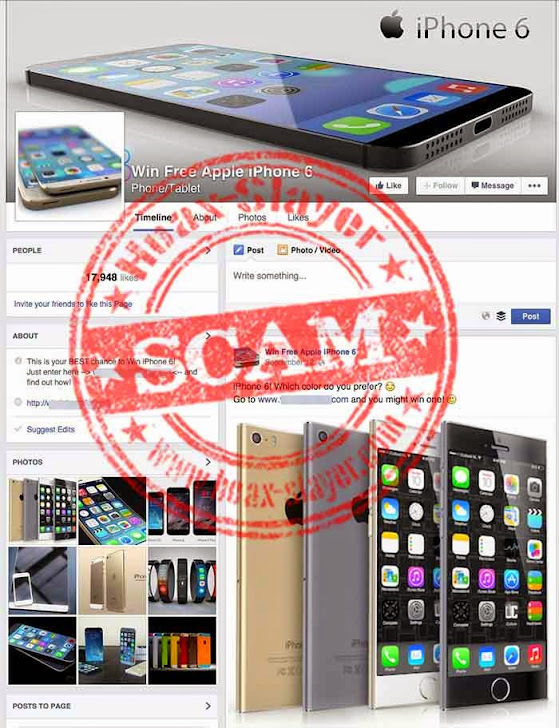 Sometimes these scams are very obvious and easily avoidable, but many times they are irresistible and easy to fall for, just like this Win iPhone 6 scam. Despite Facebook's security measures, safe and secured social networking rests in your own hands and if you aren't paying attention to such scams, you could fall for one such even without ever realizing. So, if you are served with any suspicious link or post, do not try to click on it, no matter even if it’s from your closest friend.